It seems like forever since I posted a dessert! Especially since my mom invested in full-size candy bars. Brats. Being a crotchety old person is nothing new, though. 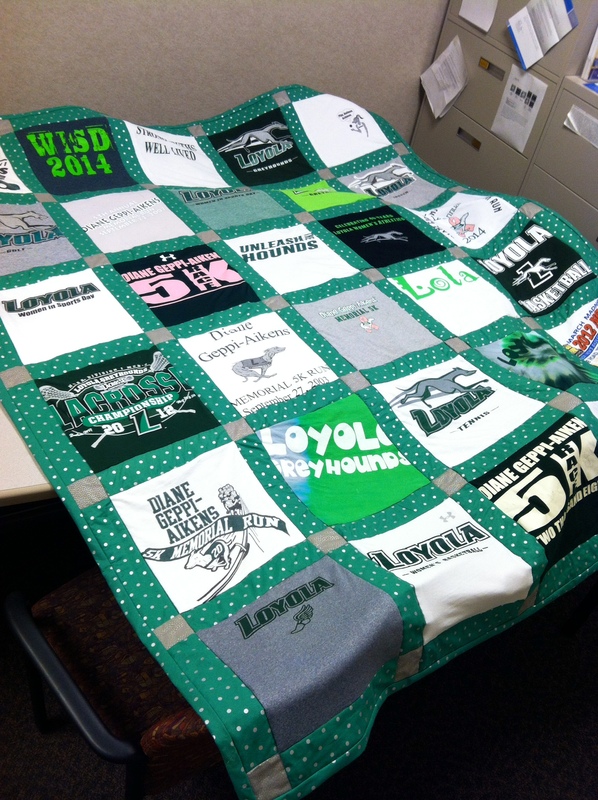 This is my latest quilting achievement- this one for the Loyola Athletics department so basically I’m famous. And now I’m working on a baby quilt for my friend Stephanie’s baby shower next weekend, but I’ll share photos and the tutorial I’m using once it’s finished. I’m obsessed with it. Start having babies, imaginary friends, and I will quilt for you. Complaining about lack of manners, quilting, and baking. The old lady trifecta. I’ve made brownies several times and, to be honest, they’re better out of the box. I don’t know what it is, but if you’re going for conventional brownies just stick with Betty Crocker. If you’re going for flourless brownies, stick with Ina Garten. Chop the chocolate. Melt it in the microwave or using a double boiler with the butter. You don’t have to be as worried about it seizing since you have the butter in there. Stir it together until smooth. It will be very liquid-y, even more than the chocolate river that Augustus Gloop fell into. Set it aside to cool. Crack your eggs into a bowl. Start to whip them with a whisk attachment on your hand mixer or stand mixer (jealousy) for 2-3 minutes. Slowly add the sugar, 1/4 cup at a time and continue to whip it until creamy and increased in volume. It should look almost like custard. Pour in the cooled chocolate and butter mixture and combine. You want to make sure the chocolate is cooled, otherwise you might scramble your eggs! Add the vanilla, then the cocoa powder and salt. Continue to mix until smooth. Prepare an 8×8 baking dish by greasing it with butter and then lightly coating it in cocoa powder (or flour, but that sort of defeats the purpose of flourless brownies). Pour the brownie mixture in and spread evenly. It’s a little thicker than traditional brownie batter. Bake at 350 for 30-35 minutes. Allow to cool completely (you know I didn’t do this) then cut into small squares. These are much richer than regular brownies, so the servings can be smaller. They aren’t as sweet as regular brownies, either- better for dark chocolate fans like myself. You could trash these up by throwing in your leftover Halloween candy. And if you’re looking for other trashed up recipes you should check out this virtual baby shower thrown by all the people I would love to be friends with. That quilt came out great, I love the colors and the fabric you chose! Your skills are so famous – I feel so lucky to have an Erin McDermott original on my couch that I lounge with daily. Also – excited to try this brownie recipe for my next Passover feast! The flour-less nutella cake was great, but these look awesome!! Yes I was thinking of you when I made them! You’ll have to send me the Nutella recipe, although usually I can’t buy Nutella because I have no self control… glad the quilt is working in your new place!